Right. She remembers every year. Maybe it’s because of Claire’s nudging or because I just added their birth story as its own page here on my blog, but, for whatever reason, I was more eager than usual this year to make the short trip out to the cemetery. Sometimes I forget to think about that tall white marble stone etched with the prettiest name I’ve ever put together; I hate for people to worry that I’m not healed or moving on with the beautiful life He’s given after our loss. I remember visiting cemeteries with my great-grandmother and feeling a special sacredness about the whole thing – as well as some trepidation. (This particular grandmother got after us for walking across where the bodies were buried . . . is that standard?) I don’t think I’ve instilled that same sense of awe very well, but I did ask the kids as we piled out of the van with our beach bucket full of garden roses to please be respectful. They did a great job. 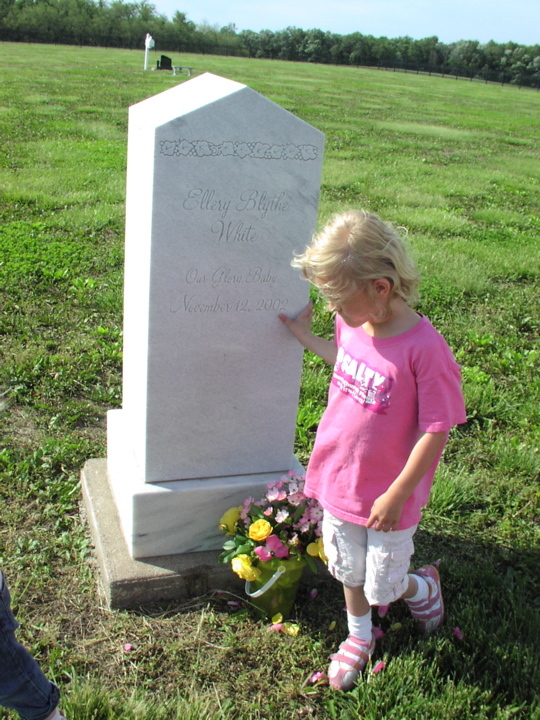 Granny Grubbs would have been sure the stone was going to fall over and crush one of them while they hugged it, and posed around it, and traced it’s script words: Ellery Blythe White – Our Glory Baby. But it worked for us. Maybe someday we’ll plant some purple petunias or add a smooth rock garden, but for now our simple offering will do. We didn’t stay long, but we remembered. And that’s what it’s about. Remembering. Love that photo of Claire with the stone. This brings tears to my eyes and joy at the same time in knowing your miracle in Claire and the strength youve drawn. Thanks for shareing. Beautiful! The thing about not walking across the graves was standard in our family, and Marissa has already learned that “rule”. We went last weekend after I attended the visitation for my friend Erica’s Dad. I pulled the grass around the stones as I was taught to do when I used to visit the cemetary with my Mom. I told Marissa stories (again) about her grandparents, and great-grandparents, and the uncle that I never knew that died when he was a baby (my Dad’s brother). We walked around looking at stones and we talked about neighbors and their families that were buried there. Especially the story of the boy that I shot in the eye with a homemade bow and stick when we were kids. He later died a hero in Afghanistan, leaving behind a wife and kids of his own. We straightened up flower pots, and picked up trash. And we remembered. How wonderful, Carol! Your children will learn much from moments like these. I thought of her yesterday….and of our own little Luke. 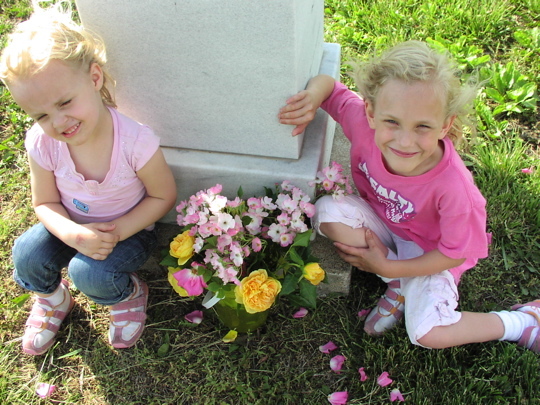 And in both cases I wished I could have taken flowers to their graves….just to remember. I love these pictures! Yes, we probably won’t always be right here to take flowers. Thankfully there are so many other ways to remember. Oh! The picture of Claire and the Glory Baby stone is too beautiful for words. I’ve fallen behind on this remembrance, but I promise to do better.